You are currently browsing articles tagged documentary. Reading is known as one of the world’s leading centres for the study of food and health. We have outstanding facilities and expertise to study the whole food chain – from climate, weather, soil, farming, food processing, nutrition, to human health and cognition. The programme, which has its final episode this week (Friday 10 March) at 9pm on BBC Two, shows the effects food has on our taste buds, brains, and bodies. Alongside the widespread locations and elegant CGI are, of course, frequent shots of scientific demonstrations carried out at the University of Reading in the Department of Food and Nutritional Science, and in the Department of Chemistry. 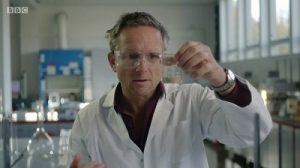 In the first episode, We Are What We Eat, I helped presenter Michael Mosley to separate the various components of breast milk in our Food Pilot Plant; investigate how the proteins in egg unfold and denature at different temperatures to create the perfectly cooked egg; demonstrate the production of gas by yeast; and compare fats from different food. You are warmly invited to the next in our research seminar series on Thursday 2 March, 4.00-6.00 pm, G03, Henley Business School. We are delighted to host a talk by Andréa Franca. Andréa’s abstract and biographical note can be found below. The 15-minute short video Passeio Público [Public sidewalk] is a new expression of subjects dear to Andréa França’s heart as a researcher. For years she has been investigating the relationship between documentary and the usage of archive film through a few key questions which include: What artistic potential can be extracted from using archive footage in documentaries? How has such footage been reused? In what aesthetic form have the subjects of memory, history and forgetting been brought into play? The most thought-provoking documentaries in Brazilian film that draw on previously shot material are the ones that interrogate the document as objective evidence left behind by events. Passeio Público also seeks to open up the field of meaning of the images from the past. It tells a surprising story about images of the Brazilian city of Rio de Janeiro in the 1920’s. A story told through the debris of an unknown Alberto Botelho’s film made at that time and given as a gift to an Italian prince. Andréa França Martins is researcher and Associate Professor in the Department of Social Communicationat Pontifical Catholic University of Rio de Janeiro (PUC-Rio). Member of the Decision Committee at SOCINE – Brazilian society of Cinema and Audiovisual Studies. She is the author of Terras e fronteiras no cinema politico contemporâneo (2003). Her contributions include chapter “Cinema de terras e fronteiras” for História do Cinema Mundial (2013, 7 edição), “Os brinquedos-fósseis e o tempo da memória” for Eu assino embaixo: Biografia, memória e cultura (2014), “La invención del Lugar en el cine brasilero contemporâneo” for Déplacements culturels : migrations et identités (2013), “Documentary Cinema and the Return of What Was” for New Argentine and Brazilian Cinema: Reality Effects (2013), “A imagem-excesso, a imagem-fóssil, a imagem-dissenso: propostas cinematográficas para a experiência da ditadura no Brasil” for Narrativas Sensoriais(2014). She is researcher of National Counsel of Technological and Scientific Development /CNPq.